What is a meme? It's defined as an element of a culture or system of behavior that may be considered to be passed from one individual to another by nongenetic means, especially imitation. That is why I created an AI based website that can imitate qualities of existing memes to find new exciting memes. 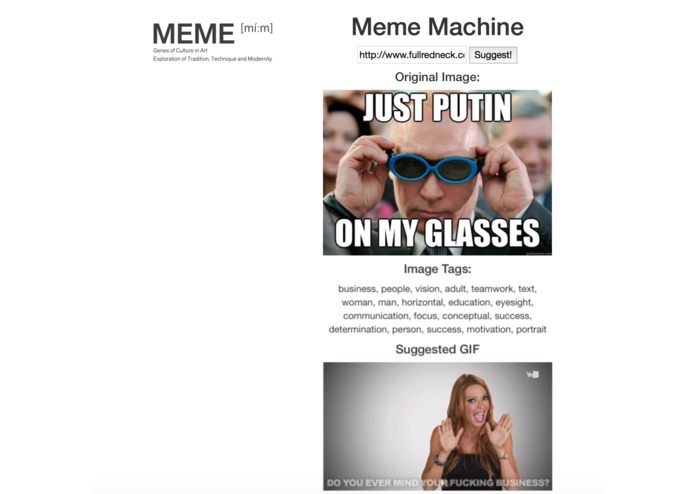 Simply run it through the Meme Machine and get artificial intelligence based GIF suggestions from Gfycat. The website is designed for desktop and mobile so feel free to find new memes on the go. What really sets Meme Generator apart is that it can find memes of similar context or meaning in addition similar content beyond what a pure visual comparison could do. The dynamic use of Clarifai AI in combination with an algorithm that creates noticeable variances in the search parameters so that there are hundreds of possible suggestions. Furthermore by using Gfycat's search API Meme Generator can return suggestions enhanced by Gfycat's own preferential search algorithms. One of the challenges I faced was working alone. This was the first hackathon I did on my own. 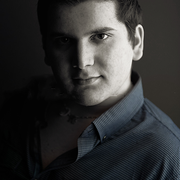 I became very familiar with the Clarifai and Gfycat APIs and I made a project I am really proud of. 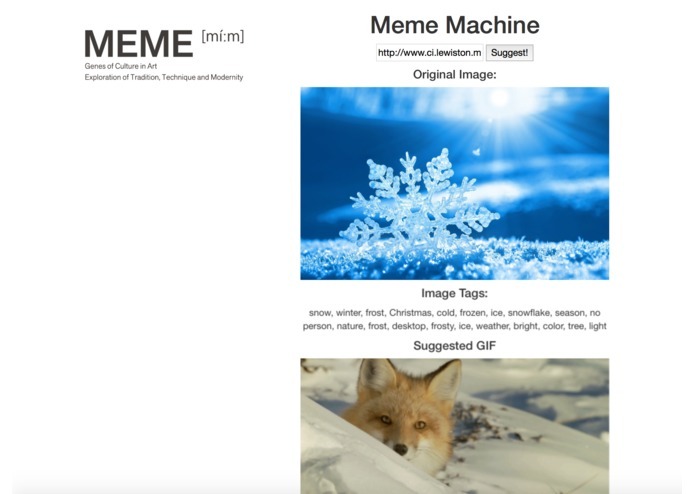 Just Finished an update that creates a tag cloud of popular tags found across the memes processed by the service and then gives a suggested GIF of the most trending context tags of the images given to Meme Machine. Basically the site now can give you a suggestion that is based on all the memes you have given it.